Time for the latest in my series of training tips that aren’t really training tips at all, but more accurately party games for the discerning runner*. When it comes to choosing a route, a road run along the streets of my home town is a bit like fast food; convenient, better than nothing, but ultimately bland and uninspiring**. Plodding my way along a familiar grey landscape isn’t ideal, but it does the job when it’s too dark to hit the trails (which reminds me, has anyone seen my head torch?) or I just don’t have time to get out to a more appealing route. That’s why I came up with a little game to pass the time, which I call “Going Shopping”. Where I live, we have one big Tesco superstore on the outskirts of town and three of the little Tesco Express stores dotted around. I decided one dreary wet night that, just for the hell of it, I’d try to pass by every one of them over the course of my run. Quite often I’ll just switch my brain off and zone out as the miles wash over me, but this wasn’t one of those runs so It was good to have something to focus on, however pointless. I’ve Gone Shopping a few times since. Sometimes I’ll challenge myself to find the shortest possible route between the shops, and in doing so discover parts of town I’d never come across before. Taken to clumsy parkour-like extremes, this could potentially lead to me invading people’s gardens or hurtling through a busy branch of Halfords with a total lack of respect for that carefully stacked display of fluffy dice in my path. I’ve currently got the route down to just under seven miles, but there’s always a slight frisson of nervous excitement that if they decide to open a new store somewhere it’ll completely change everything. I’ve just read that last sentence back to myself, and am now curled up into a tight knot of self-loathing. Of course, you can substitute Tesco with any other shop or similar location, but you do need to be careful with your choice. For example, running between your three nearest branches of Otter Republic*** will leave you VERY tired. Similarly, unless you live on an oil rig or are ultrarunner Scott Jurek, I wouldn’t recommend trying to run past every branch of Costa within a five mile radius. I’ve recently come up with a progression to Going Shopping (I suppose you could call it “Going Shopping: Xtreme UltraMax Defiance”, if you really wanted to). The rules are exactly the same, except that at every shop you have to buy a 5kg bag of dry dog food so that you’re running with an increasingly heavy load. Also you get to keep the dog food. If they’ve sold out of dry dog food (perhaps there are a lot of GS:XUD enthusiasts in your area), do NOT under any circumstances buy 5kg bags of cat litter instead. Yes, they’re the same size and weight, but if the bags were to split near the end of the run and cover you in a tsunami of absorbent granules, you could become massively dehydrated in less than a second. * “Discerning” does still mean “infantile and easily distracted by nonsense”, doesn’t it? *** Not sure if that exists any more. I think they may have been taken over by the American chain “Otters! Otters! Otters!”. Run-shopping is an ace game. An early attempt to run and buy toilet rolls led to a super-long origami session to get all the paper in my too-small running backpack (why do they only sell mega-16-roll packs?). Salad is a good thing to go buying, as it doesn’t weigh much. Pitta bread is easy to fit in. My worst purchase was actually dry cat food – it rattles and clearly exudes a slight food-y aroma. Suffice to say I’ve never been chased by so many excitable dogs on my way home. I really want to know how many people will have found this post because they stuck ‘perils of cat litter’ into wordpress’s search engine. For over a year the majority of my hits have come from people searching for “pictures of swans” according to wordpress stats. I like the sound of this game. I will be taking my backpack out and doing a tour of the many branches of Sainsbury’s Local that Leeds has to offer. I want to hear about your adventures taking the shortest routes … and pictures please! Of you crashing through garden fences and finally making it into the Tesco store covered in Granny’s bras from the washing lines and with one foot wedged into a garden gnome. If you choose to run past all the Greggs in a 5-mile radius of central Manchester you’d easily have done a half-marathon at least. 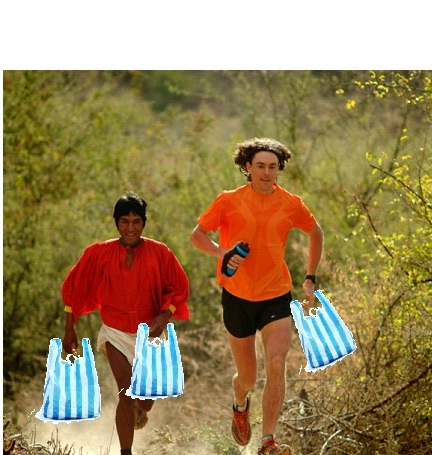 “Run” and “Greggs” in the same sentence. I think that’s a first. There’s only so many times I could run past a Greggs before succumbing to a sausage roll frenzy.